aRu thozhil – six types of karmas. You are of the nature by which the brAhmaNas who follow the dharmas, perform the very difficult karma yOgam in order to attain you. It talks about the ways of the brAhmaNas – they perform hOmam and maintain three types of agni, know four type of vEdhas, do five types of yAgams, and perform six types of work. This goes to show the difficulty of doing karma yOgam which they perform for attaining him. It implies that emperumAn goes along and helps such brAhmaNas also and gives them what they needed. In the next few phrases of the prabandham, AzhwAr talks about the greatness of emperuman, that is, He goes along and helps those who use Him and also other ways as means and gets them the benefits they wanted. muththI … – As said by “yOgO yOgavidhAm nEthA” [vishNu sahasra nAmam 18,19], He is the one who is the means for everything, and those who follow other means to get Him to help with what they needed, He is amicable to achieve that for them; To begin with, AzhwAr talks about the first of such other means that is karma yOga which is followed by those brAhmaNas who follow the righteous ways. 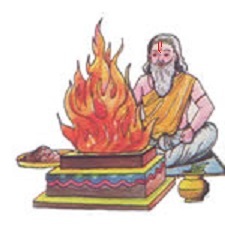 muththI – Like how it would be hard for her to take care if she gets three hungry babies in one delivery itself, brAhmaNas try to satisfy the three types of agni (which do not get satisfied how much ever firewood is given to it); the three types are gArhapathyam, AhavanIyam, dhakshiNAgni. nAnmaRai – In order to do that karma yOga properly, they practice/recite all the four vEdhas, rig, yajur, sAmam, and atharvaNam. aivagai vELvi – dhEva yagyam, pithru yagyam, bhUtha yagyam, manushya yagyam, and brahma yagyam [thaiththiriya Upanishad, Ara – 2-10] are the five types of yagyams that the brAhmaNas perform every day. aRu thozhil – brAhmaNas perform six types of work – yajanam (doing yAgam for self), yAjanam (performing yAgam for others), aDhyayanam (reciting vEdhas), aDhyApanam (teaching others to recite vEdhas), dhAnam (giving others what they need), prathigraham (obtaining from others what is needed). For other varNams only some of these are applicable. By this, it talks about the extreme difficulty of performing karmya yOgam. Since it talks about the brAhmaNas who are fully possessing the greatness of them, they are considered to be following the karma yOgam along with the gyAnam (knowledge) of doing such karmas. andhaNar vaNangum thanmaiyai – by such karma yOgam, they want to reach You, and so they surrender to you and pray to you; you are of such nature. This entry was posted in iyaRpA, thiruvezhukURRirukkai and tagged 4000, azhvar, azhwar, dhivya, divya, english, introduction, jeeyar, jIyar, kaliyan, kutrirukkai, meanings, naalayira, naalayiram, prabandham, thirumangai, thiruvezhikURRirukkai, thiruvezhu, vyakyanam on July 8, 2015 by raghuram.